Pinay WAHM: Asteroid to Hit Mars in January 2008? Asteroid to Hit Mars in January 2008? Remember this post I did a few days ago about the possibility that Mars will be hit by an asteroid in January 2008? Well, the chance of the asteroid hitting Mars is now increased by 4%! Last week, the asteroid known as nondescript 2007 WD5 had a chance of 1-in -75 to hit Mars but just this week the odds are increased to 1-in-25. 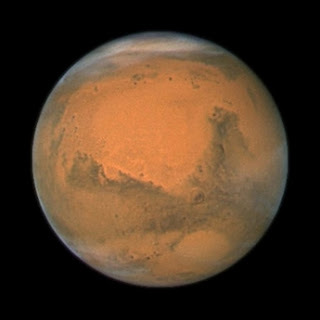 Now that is a big chance that Mars will have an impact on January 30, 2008. Exciting? Probably. Some people are actually thrilled or excited while hoping that the cosmic smash happens as predicted. As long as it has no impact to our dear Earth, then it's okay. I don't think those who are excited about this cosmic event will be as excited if the asteroid is actually hitting our home.